Micromanagement and delegation. One belongs in a high performance team and the other doesn't. No prizes for guessing which belongs where! As you move up the leadership ladder the need to get your goals achieved through others becomes one of the most important skills you can fine-tune. The 'snooperviser' is one of the most frustrating and challenging of all leaders to work for. Let's take a quick look at whether you are guilty of micromanaging ... which will be putting the brakes on your high performance leadership journey. You've got high turnover. When people feel they aren't given the freedom to do their job properly and/or their talents are being wasted and/or they aren't learning and growing they'll up and leave. Anyone who is capable and ambitious will not hang around allowing someone to frustrate and block their progress. Losing good people from your team will send big warning bells to your senior leadership team and this will absolutely put the brakes on your career. You've got low morale. People who don't feel they can contribute in a meaningful way lose their loyalty and commitment to the objectives of the organization. When the feeling that they can make a difference withers up and dies, lethargy and apathy set in. Your demotivated team is providing lower quality work. People give up and just decide to go along with whatever you want, simply because it's easier. As well you are probably only left with the lower performers because the good ones have up and gone! Productivity, profitability and new business development are all declining. Because you are spending so much time 'working in the business', you don't have time to 'work on the business'. You'll be bogged down amongst the trees and won't have the time to use your creative talents to run the business and create the bright future the organization needs. And because you've trained your team to not think, not make the effort ... because you'll only come in all over the top of them ... they too will miss or not bother reporting opportunities to improve the business. You are focused on the wrong priorities. 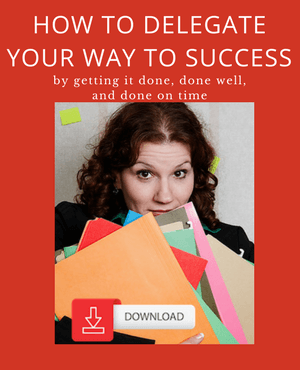 Overwhelmed at the volume of work to get done may cause you to work on the easier tasks at the expense of the bigger, longer range tasks and thinking that drive business success. You career progress has stalled. You will not have developed the talent and bench-strength of future leaders within your team so one to two successors are ready to take your place should new opportunities open up. As I explain in "How To Delegate So You Get it Done, Done Well, Done on Time" trust is one of the essential elements in all high performing teams. What, and how, you delegate is one of the core indicators of the trust levels between you and your team members. Dumping unwanted or overflow tasks is not high performance delegation. and delegating well to all others in your team? This suggests that the problem may belong with the team member. Maybe they have under-delivered, broken promises or just aren't quite at the skill level required to completely hand over the particular assignment.